You can now find the best Divi examples even faster! Divi Theme Examples has been hosted in Australia with Panthur hosting since it was set up almost 3 years ago. I was living in Sydney for 12 years and creating websites for Australian clients when I signed up for my hosting at Panthur, and so when Divi Theme Examples was born the easy choice was to just add it to my hosting plan with them. 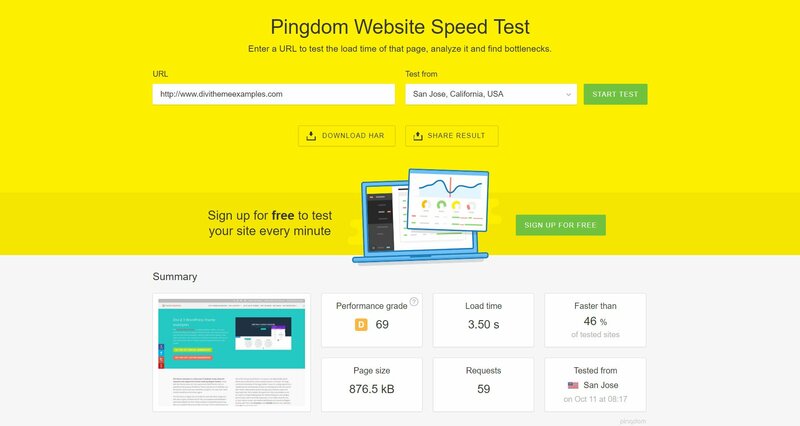 As the site grew in popularity I upgraded to a better plan with Panthur, but even with optimizations to speed up my Divi site, I was still seeing slow page load times of 3.5s or longer (particularly at high traffic times when limits were hit). Affiliate disclosure – This page contains affiliate links to Siteground which means that if you purchase hosting via the link I will get a commission as owner of this site. 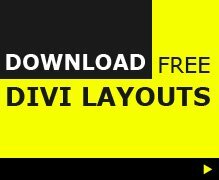 By using these links you will help keep Divi Theme Examples a forever free resource for the Divi community. Why did I choose Siteground to host Divi Theme Examples? Divi Facebook groups. If you have spent much time in any of the Divi FB groups, you will have seen plenty of posts about hosting and more often than not Siteground came out on top in terms of recommendations and positive experiences. These are recommendations mostly by web designers and developers so for me they carry extra weight. Personal Experience. I have had a couple of smaller sites hosted with Siteground on the shared hosting plan for a year or so and was always happy with the service and support. Support is pretty much instant and from past dealings the support staff know their stuff too. Whilst I was unsure of how much better the Cloud plan was going to be I figured you get what you pay for and decided to take the plunge anyhow. WordPress recommend them too. Siteground is one of the 3 hosting companies recommended by WordPress themselves, which of course is a big enough reason in itself. Personal developer recommendations. Being in the web design circle for a while now, I have quite a few trusted friends who offer personal recommendations I’m happy to follow and Siteground was just one of those. So based on these factors I decided that Siteground was a good choice for hosting Divi Theme Examples and went ahead and ordered a new hosting plan with Siteground. 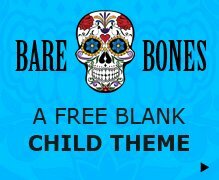 What hosting plan is Divi Theme Examples on? With ~50,000 users and ~200,000 page-views a month, the shared hosting plans at Siteground were not really an option, so I went for the next step up, which was the Entry level Cloud Hosting plan, which costs $80 per month. The cloud plans aren’t the cheapest, but with a high traffic site something with more power was needed. The plan is also easily scaled so more blocks of CPU, RAM, storage can be added (for $10 a time/month) as traffic and resource demands increases. The main reason I decided to move my hosting was to increase my site speed and get pages loading in sub 2 second mark. Site visitors love a fast website, Google loves a fast websites and so I wanted a fast website. Before the site migration to Siteground page load times were rarely below 3.5 seconds and quite often lagging way behind that. As you can see from the screenshot below moving Divi Theme Examples to Siteground has given a huge speed boost. The site is still using cloudflare but now uses the Siteground Supercacher instead of WP Supercache.The result has been a dramatic drop in page load times, with the fastest shown in the Pingdom tools screenshot below at just 666ms! Pindom speed test results here. I got onto the livechat in a state of panic and started shouting… ok, well shouting at my laptop really. The livechat support managed to stay calmer than me and were able to fix the issues and go on to suggest some solutions to prevent any future excessive CPU usage on my site. 1. add the heartbeat control plugin to limit the repeated POST requests caused when I leave the WordPress admin open. 2. Block bad bots from accessing the site using this code. 3. Block suspicious visits (using the Wordfence blocking tool) that were all coming from a single ip. 4. Add the Google Captcha plugin to stop bots hammering my login page. 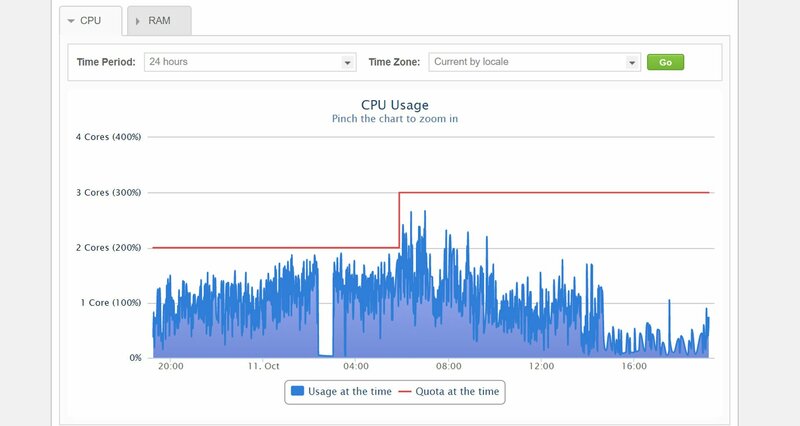 The result (as shown in the screenshot below) was that the CPU usage on the account dropped off considerably as these measures were implemented. Hopefully CPU limits won’t be hit again next month, unless I get a surge of genuine traffic. As the limits were set to auto-scale (so my site doesnt go offline again if limits are reached) an extra CPU core was automatically added to my account at a cost of $10 for the month.